I can’t remember any point in my life where I went more than 2 consecutive days without eating hummus. Hummus is Life. You know what I mean? Good. 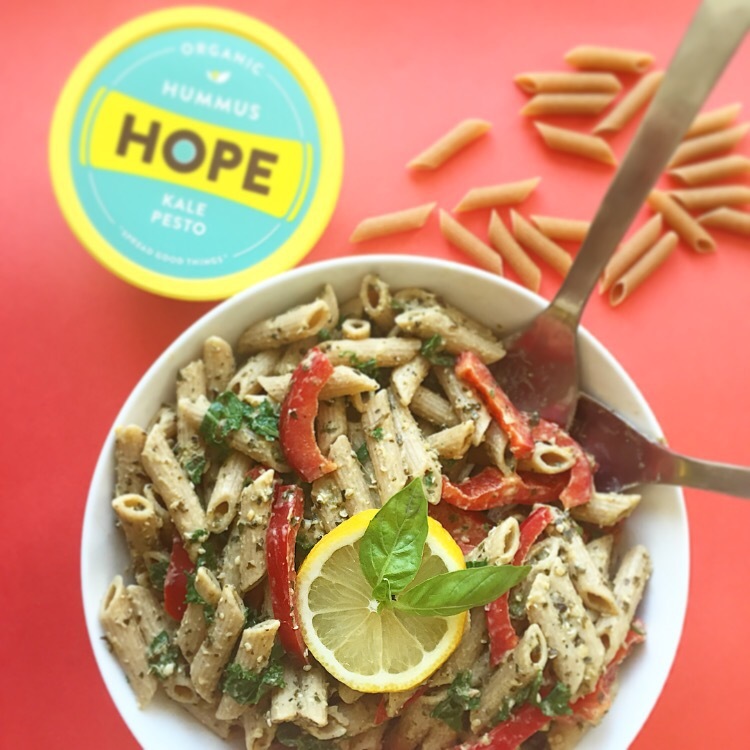 Recently, I found, and fell head over heals in love with, Hope Foods Organic Hummus brand. They make the most delicious & unique flavors using all natural (stuff you can actually read) ingredients. Their products are so pure they taste homemade and almost rustic in a way. When the sweetie pies over at Hope HQ agreed to send me a care package, I immediately started thinking about all the things I could make and this pasta salad is first up. If you’re looking for the prefect office lunch, picnic break, weeknight meal, or potluck staple – THIS PASTA SALAD IS IT! It’s creamy, healthy, well-balanced, and delicious served hot, cold or room temp. The Kale Pesto Hummus is the star of this show but you could really use this easy peasy method with ANY of the Hope hummus flavors. Go wild! This stuff is good for you. 2. Place kale ribbons at bottom of pasta strainer & place in sink. Once pasta is cooked, pour and strain pasta water right over kale to season & wilt it in one easy step. <-Pro-tip, you’re welcome. 3. 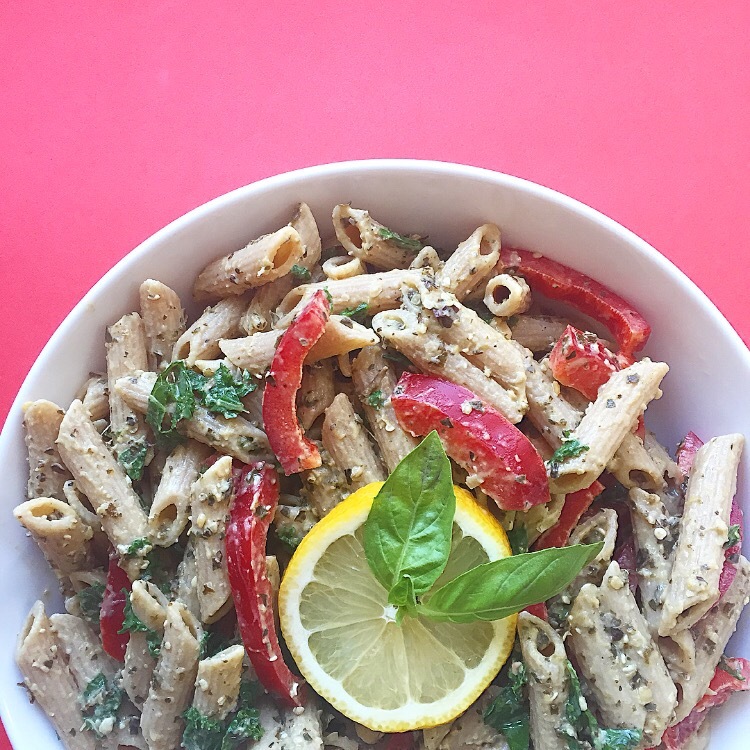 In a large bowl, mix pasta, kale, bell pepper, lemon juice, and Kale Pesto Hummus. Mix well. Taste. OMG SO YUMMY RIGHT?! 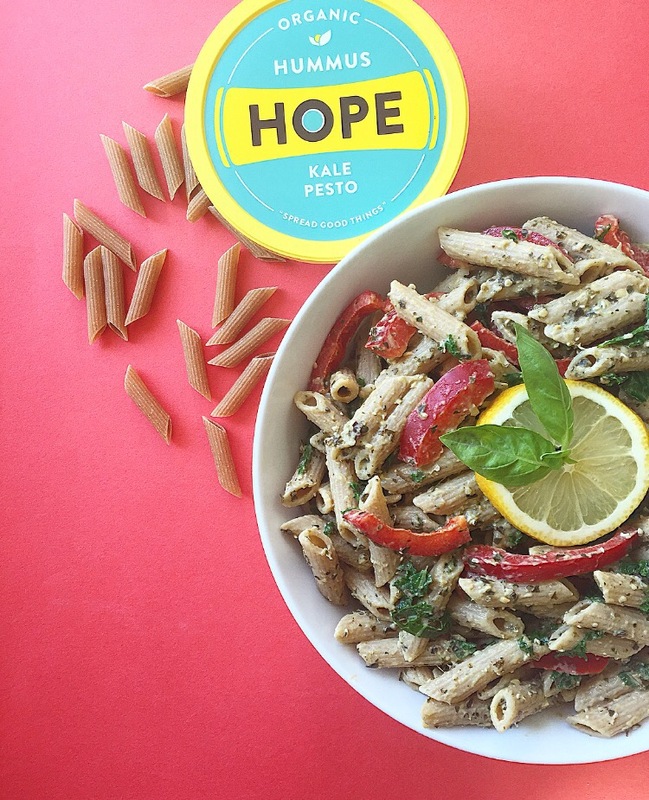 note: if you dont have the Hope Kale Pesto Hummus: first, I’m so sorry for you. second, you can easily make this by making your own Kale Pesto & mixing it with a little hummus before adding to the pasta.